Background from DepositPhoto. Guitar clipart by Trina Clark. 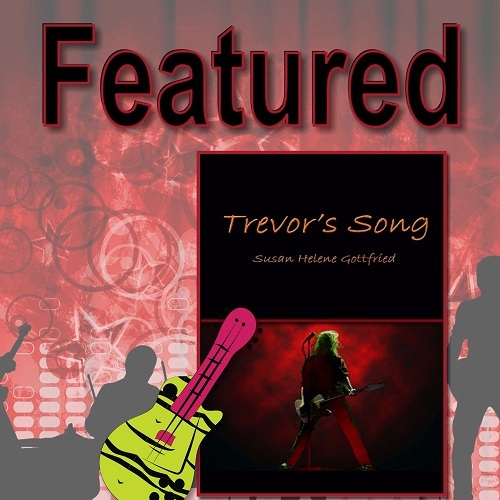 ShapeShifter band dynamics will never be the same with this new woman on the scene, and the distractions of two girlfriends and a world tour aren't enough to keep Trevor from feeling like his carefully constructed world is crumbling around him. The pesky little illness he's been hiding from his band mates doesn't help, either. When Mitchell Voss had disappeared for a week after their impromptu date, Kerri Broadhurst hadn't thought much about it. It wasn't like they had a standing agreement to meet over the tomatoes. When she didn't see him the second week, she figured she'd been dumped. Which was sort of sad, in that he'd been an interesting person once she'd gotten him to actually speak. At the same time, though, it was perfectly okay. She was a busy woman with a full life of her own. Juggling a rock star's schedule with hers wasn't something she particularly wanted to do, especially since she refused to be one of those women who put everything on hold for her man. He finally reappeared at the grocery at the end of that second week, towing two bandmates who, she hoped, had more musical talent than subtlety. She could tell by their approving looks that she'd passed muster -- and was surprised by how good that made her feel. She wasn't one of those women who needed a man's approval to boost her self-esteem. Mitchell invited her to join him and the other two for dinner: just burgers on his grill and a case or two of beer. Nothing fancy, was that okay? Waking up in his bed the next morning, too hungover to move but alert enough to register that she was fully clothed and alone, she began to doubt she'd passed his test. It wasn't until he'd taken her home and kissed her gently, almost chastely, that she started to hope she'd see more of the seemingly elusive but very hot Mitchell Voss. When the knock came at the door of her loft a few days later, she called a loud, "It's open," and kept working on the canvas in front of her. The portrait was turning into a royal pain; she wanted it done and hanging in the queen's house already, payment safely in the bank so she could catch up on her bills. Whose idea had it been for her to work for drag queens? And why had she listened? Sure, they paid well -- almost obscenely well -- but they could be hard to work with. One thing Kerri had learned early on was that they preferred flattery over realism. Once she'd learned that, she'd been home free -- until this latest client. This was beyond flattery and into imagination. The door rolled open. All was still. "Problem?" she asked, still focused on the fold of red, sparkly dress. "You're working," he said, but stepped into the loft and rubbed his hands down the fronts of his thighs. "I knew I should have called, but … you forgot to give me your number." His nervousness was amusing, Kerri thought. So was the fact that he'd come in person when he could have waited to see her at the grocery. Or used a phone book; unlike him, she was listed, in both the personal and business sections. "Oh, I could use the break, believe me." She quickly washed out her brushes while he examined the loft door as if he was trying to figure out how it worked. "What's up?" she asked when it became obvious he'd focus on simple mechanics all day if it would let him avoid speaking. "Umm… well, here's the deal. You heard the regional music awards are being held here in town next week? Daniel's girlfriend really wants to go, so he decided that we'd all bring dates and …"
Kerri cocked an eyebrow at him. "And?" "Want to come? With me?" She blinked. All of a sudden, he'd gotten over his shyness and had stopped squirming, had … well, ShapeShifted into a confident man whose presence made the room crackle with energy. "Umm," she started, and his face instantly changed to that of a desperate little boy. "Yeah, of course. Sure." Mitchell put a hand to his chest and breathed a sigh of relief, his eyes wide. "It'll be another late night, so you want to plan on crashing at my place again?" His words tumbled on top of each other. "If you want, I'll pick you up early so you can get ready at my place, take your time and all that. We'll order in Chinese or something before we go -- you like Chinese, right?" Kerri had to chuckle. Had the guy ever asked a girl out before? "I do," she said. "One question, though: how fancy?" "I usually just eat it right out of the box." Now he looked confused, his eyebrows furrowed so deeply, they almost touched. "Isn't that why they make those funny little take-out boxes and give you chopsticks?" "The … awards thing. How fancy?" He shrugged. "As fancy as you want, I guess." Okay, so I’m this hot rocker chick, right? You’d think I’d dream of travelling the world and attending every last one of the big music festivals – Download, Sonisphere, Rock in Rio… all of ‘em. And, sure, give me VIP or a working pass and I’m there in a heartbeat. But if you leave me to my own devices, I’m heading outside. To the country’s National Parks. I’d love to be one of those loony people who visits every last Park. Travel does play into my books, simply because when you write about musicians, you wind up writing about their touring cycle. The Demo Tapes anthologies feature tales from the road, and Trevor’s Song was largely set on the road. I do listen to music while I write. I keep it simple: no playlists over here, just satellite radio, tuned to Octane for the hard rock tunes. It depends. When my daughter gets her hands on it, she runs it full of Nickleback and Evanescence. Me, I’m the Metallica/Disturbed/Godsmack queen, although the new Shinedown (Amaryllis) is getting heavy play from us all over here, as well. Probably that November night in 2008 when I went ahead and pushed PUBLISH on the first Demo Tapes anthology. This was before the Kindle, before the Nook, before e-books were such hot commodities. Back then, self-publishing wasn’t respected and it could have very well ended my literary ambitions. I have written a series of novels! Well, only two so far in the Trevolution, but when you add in the three (soon to be four) Demo Tapes short story anthologies, you get a full series. There might be more novels directly involving Trevor, Mitchell, and the gang. I haven’t decided yet. This is tricky and totally unrelated to the rest of the questions, but I wanted to include it because I seem to be one of the few people who doesn’t take these things personally. If you can detach yourself from the review, there might be some very good information and constructive criticism in there, and that’s the beauty of a negative review. Don’t dwell on the negativity; look for what you can learn and how to improve your writing. Thanks so much for taking time today to give us some insight into you and your book. It's been a pleasure talking with you. Also, I'd like to mention for our readers that the 2nd book with Trevor was just recently released. The author has graciously agree to give one lucky winner a digital copy of Trevor's Song and King Trevor via Smashwords coupon codes. So enter below using the easy rafflecopter form. Susan Helene Gottfried is the author of ShapeShifter: The Demo Tapes — Year 1, ShapeShifter: The Demo Tapes — Year 2, Trevor’s Song, and ShapeShifter: The Demo Tapes — Year 3. She can be found online at http://westofmars.com, where you can find The Meet and Greet, among other goodies. To fill her time, Susan works as a freelance book editor and works as a paid reviewer. Paranormal fiction is just fun to read. It can be so many things and the author can make their own rules.